UPDATE: PlayStation 3 Slim does bitstream HD audio over HDMI | What Hi-Fi? There has been much speculation about the specification of the new PlayStation 3 Slim, so allow us to confirm one thing: it can bitstream HD audio over HDMI. We have a sample in for review and as this image of the PS3 Slim's display confirms, it will bitstream HD audio. Look out for a full review on the site next week, just as soon as we've had time to thoroughly test it. There looks to be more good news on the horizon for fans of the PlayStation 3. The new PS3 Slim is rumoured to be able to bitstream Dolby TrueHD and DTS-HD Master Audio. Previously able to decode HD audio on board but not send it out in bitstream form, we're led to believe that the PS3 Slim may rectify this and deliver HD audio via bitstream. We are looking to get full confirmation from Sony and will of course let you know just as soon as any further specification is 100% confirmed. Sony has now officially confirmed the PlayStation 3 Slim will be on our shelves in just a few weeks. The eye-catching unit is 32 per cent smaller, 36 per cent lighter and uses 34 per cent less power than the original PS3 and is due out in the first week of September. There was no mention of any spec changes, so expect the Slim to boast a 120GB hard drive and the all-important Blu-ray drive. 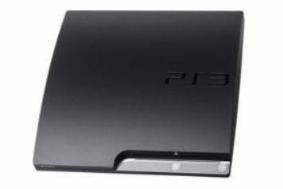 The new PS3 Slim will retail for £249, and comes with the new Playstation 3 3.00 firmware. The upgrade makes some changes to the user interface. Crucially, the PS3 Slim is also rumoured to be much quieter in operation than previous incarnations. Sony is also launching a video delivery service, via the PlayStation Network, to allow PS3 or PSP users to rent or buy films, in either standard or high definition. The service goes live in the UK this November. The web has been awash with rumours of a brand new PlayStation 3, and it seems for once they could be true. US retailers K-Mart and Sears have begun taking orders online for a "new low price & a new exciting PlayStation 3", according to (badly written) banner adverts on their sites. Previous speculation had suggested that Sony would release a slimmer machine complete with a 120GB hard disk drive.